It is possible to import all of the names from one list to another. The usual time to do this is when creating a new list, and importing last year’s names to it. 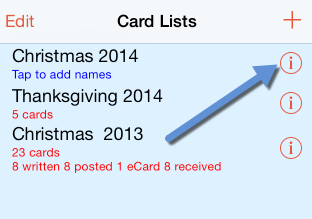 For example, when creating a Christmas 2014 list, you will probably want to import the names from the Christmas 2013 list. To achieve this, go to the screen showing the lists. Then, tap the (i) icon beside the list into which the names are destined. For example, if you want to import Christmas 2013 names into the Christmas 2014 list, tap the (i) icon beside the Christmas 2014 list. 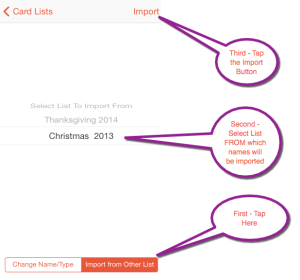 Then tap the switch at the bottom, where it says Import from Other List. Then in the next screen, select the Christmas 2013 list, and tap the Import button at the top right. The Christmas 2014 list will then contain all of the names on the Christmas 2013 list, but all names will show as not having a card sent to or received from.